UK Independence Day June 23 has become an historic date for the United Kingdom; 46,501,241 people turned out to vote for the EU referendum. “Leave” and “Remain” had been head to head from the very first minute, when the polling stations opened at 7am, until the very last, at 10pm; even though the “Remain” seemed to be winning until 4 am, when the tables have turned. 17,410,741 (51.89%) to 16,141,241 (48.11%). “Leave” won. The 12 regions of the UK voted: Scotland, London, Northern Ireland voted remain (62.0%, 59.9% and 55.7%). In the South East, Wales, South West, North West, Eastern, Yorkshire & Humber, North East and East Midlands “Leave” won, with a big gap. The highest percentage of “Leave” (59.3%) has been in West Midlands. The results have been announced this morning, June 24: the United Kingdom is not part of the EU anymore. Prime Minister David Cameron announced resignation after the vote. After all the effort they went through to keep Scotland part of the UK, is it going to leave for good? 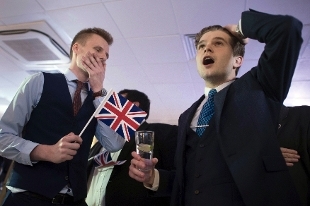 The British vote to leave the European Union has shocked the world as well as the financial markets bringing the British pound down to a 31­year low. The sterling’s value has been dropping drastically during the day, the pound sterling sank as low as $1.35 dropping in value 10%. “Indeed for many people the supposed guarantee of remaining in the EU was a driver in their decision to vote to stay within the UK.” said Scotland’s First Minister Nicola Sturgeon. She announced that a second Scottish Independence Referendum is “highly likely”. “I will also be communicating over this weekend with each EU member state to make clear that Scotland has voted to stay in the EU ­ and that I intend to discuss all options for doing so. ” There is already a campaign calling for London Independence; and London Mayor Sadiq Khand reassured immigrants that they have a place in UK. What is going to happen now? Is Boris Johnson going to replace Cameron? Is Scotland becoming independent? Leaving the EU would be a big step but will it set the nation free or condemn it to economic ruin? The decision has been taken: will the UK take the control of its borders back? Will it be free from the EU “oppressing” rules becoming an even stronger country? The answers to these questions are mostly unknown but it will take time to have them all. London divorced Bruxelles, will it regret it? The negotiations will start in the Belgium Capital on June 28, and it seem that it will take two years to come to a resolution. What we are certain about is that this is the beginning of a new chapter of the English History. Next articleBrexit – What can companies do to mitigate the impact?